Find out which is the best rechargeable battery operated coffee grinder for you. Portable electric coffee grinders have absolutely changed the coffee routine for numerous lovers of this beverage. 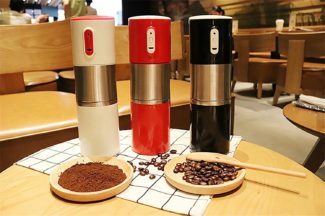 The possibility of having an appliance that you can easily pack and use whenever and wherever you want has made it easier for coffee lovers to enjoy their favorite drink regardless of where they are. With this small portable battery operated electric grinders, the pleasure of having a cup of freshly ground coffee has become pretty simplified. When you have this kind of grinder and one of these portable espresso makers you can only then consider yourself a true coffee lover. If you still haven’t considered the possibility of getting yourself a portable grinder, stay with us and find out why you should definitely think about buying one. Additionally, we are also showing you some of the most powerful appliances available in the market, if you are looking for some help picking the right one! 1 Why Should You Buy A Portable Electric Coffee Grinder? 2 What Are The Best Battery Operated Portable Grinders That You Can Find In The Market? 3 Summing Up: How To Choose The Best Battery Powered Portable Grinder? Why Should You Buy A Portable Electric Coffee Grinder? Having a portable grinder has lately become a necessity more than a luxury for numerous coffee lovers. Below, we are listing some of the most important reasons why people’s interest in these appliances has been constantly increasing. Owed to its compact size, it doesn’t require a lot of space so you can pack it easily and bring it with you when traveling. 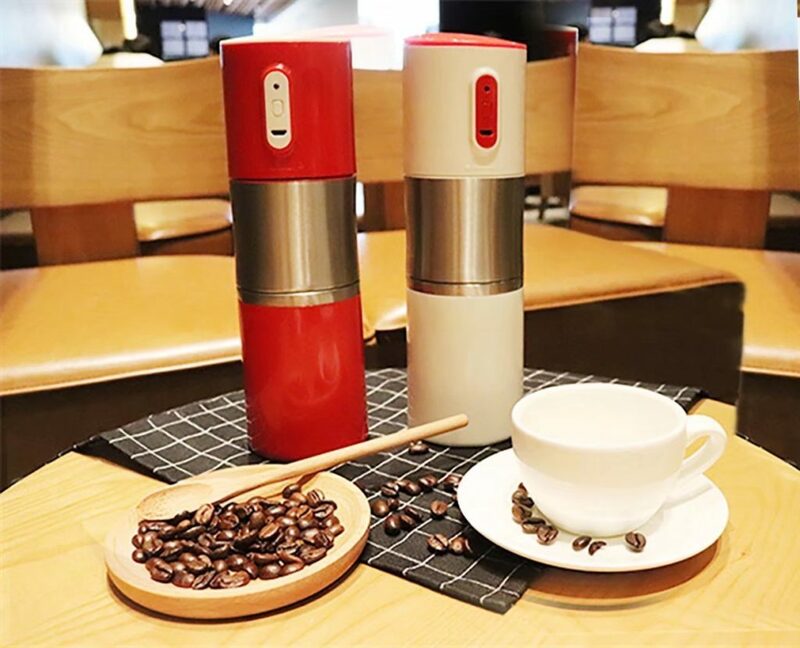 Portable battery powered coffee grinder will provide you with freshly ground coffee and, therefore, a richer taste, no matter where you are – you can use it at your home, office, or even car. It is an ideal option for camping (traveling, outdoor..) since it has a rechargeable battery and doesn’t require electricity all the time. What Are The Best Battery Operated Portable Grinders That You Can Find In The Market? Now that we have shown you some of the most important advantages of portable rechargeable electric grinders, let’s talk about some of the high-quality grinders you may want to consider when making your decision. Our favorite portable grinder and definitely the top choice when it comes to reliable and efficient yet fast appliances is this amazing grinder from Madoats. It is available in black and white color, has the capacity of 4 cups, and its dimensions are 3.5 x 3.5 x 7.6 inch. This is not just grinder this is all in one solution for coffee on the go, grinder, filter coffee maker and coffee mug. Everywhere and anytime you can grind, make and drink your favorite drink. While it’s got a practical and convenient shape that will let you take it anywhere, it is also a great solution because of its great durability. Once you have your battery fully charged using USB charger, you will be able to use your grinder for 12 grinding sessions which makes it a great solution for camping since you won’t have to charge it constantly. The automatic grinding process will also save your energy while you can also decide how coarse you want your coffee. You can choose among three easily adjusted coarseness options – fine, medium, and coarse. All you have to do is turn the knob mechanism at the bottom of the grinder. Once you’ve added the coffee and pressed the switch, the grinder will do all the necessary work, keeping the coarseness consistency, no matter what option you choose. In no longer than 2 to 3 minutes you will have up to 200 ml of coffee. The additional advantage of Madoats grinder is the fact that it has the silicon seal which is a great feature for those of you who want to take it to a trip – it prevents coffee dust from making a mess all around. This grinder brought to us by MegApple is available in three colors – black, white, and red – and it can brag with a high-quality conical burr made of ceramics. Its dimensions are 3 x 3 x 9.7 inches and it weighs less than 1.4 pounds, which makes it highly practical both for keeping it at your home and traveling. Another great option is that Megapple battery operative burr grinder also designed to brew filter coffee as well as the previously mentioned Madoats. MegApple is a great grinder and brewer with a container that lets you prepare up to 200 ml of coffee at once with minimal effort. It requires a lithium-ion battery (which comes with the appliance). In addition to this, the package also includes a USB charger that makes it convenient for recharging, whenever you need it. Another great feature that makes this grinder pretty convenient is its dust protective wear resistant shell. 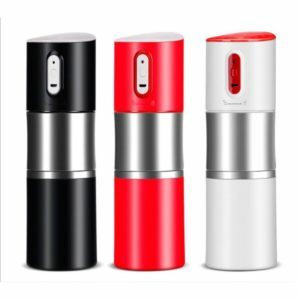 Produced by FasterS, this mini portable cordless electric coffee grinder is also available in three basic colors – black, red, and white – and it has an attractive, modern minimalistic design. Being an eco-friendly appliance, it does not require much time for recharging and once you have it charged you can use it for up to 12 times. It has a cup made of durable stainless steel, ceramic burr grinders, and the adjustable coarseness mechanism that allows you to choose how coarse you want your beans. FasterS rechargeable grinder is based on one-touch operation system which makes it highly practical, fast and efficient, with the automatic control grinding time. It also offers idling protection and safety lock. This rechargeable coffee bean mill have same features as MegApple mill and only the difference is price. Fasters grinder is much more expensive than MegApple. Another great option when it comes to portable electric grinders is the coffee grinder produced by Vasrou that weighs 1.8 lb, it has the size of 3.75 x 3.75 x 8.85 inches, and it is easily assembled and stored. It is the appliance made of stainless steel and ceramic and, similarly to the other mentioned appliances, it can provide you with up to 200 ml of coffee at once. It takes the average of two to three hours for full recharging and once it’s completely charged it can last for about 12 grinding processes. The coarseness level is easily set by rotating the adjustable knob mechanism – if you want your coffee finely ground, you should rotate the mechanism clockwise. Rotating the mechanism anticlockwise will provide you with coarser coffee. The grinding process doesn’t last longer than 3 minutes. Vasrou Portable Coffee Grinder is especially convenient for trips and camping because it is easily cleaned with water or brush. Summing Up: How To Choose The Best Battery Powered Portable Grinder? 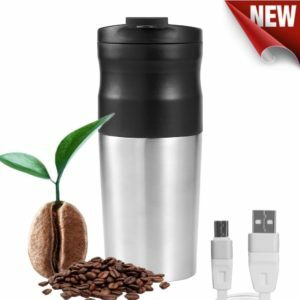 Before we proceed to discuss the best of the listed rechargeable USB travel coffee grinders, it’s necessary for us to emphasize the fact that you definitely won’t regret buying any of the listed ones. They pretty much have the same grinding time, the same capacity and they’re easily rechargeable, while at the same time offering pretty modern and functional designs. However, depending on your budget, you may want to pay more attention to the financial aspect of your purchase. Finally, in those terms, the best quality – price ratio is offered by Battery Powered Portable Electric Madoats Coffee Bean Grinder. This appliance offers the best quality within its price range while at the same time being a pretty affordable portable electric grinder.